Atomic Floyd SuperDarts earphones promise 'supercharged bass' | What Hi-Fi? 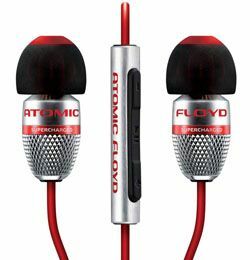 Atomic Floyd has announced the £199 SuperDarts, a dual driver, iPhone-compatible set of earphones. The new flagship model in Atomic Floyd's line-up, the SuperDarts boast dual drivers to deliver a sound that has "crystal-clarity given the additional 'muscle'... of low frequency notes." There's an iPhone-compatible in-line mic and remote control, a selection of SoftSeal silicone eartips and an anti-tangle Kevlar cable. Launching the SuperDarts, James Strong, founder of Atomic Floyd, fired a broadside at celeb-endorsed headphones: "We don't want anyone wearing a pair of Floyds because a celebrity has endorsed them. "We want people to wear Atomic Floyds because when they hear and feel them, they just can't help themselves; they have to have them." Available exclusively from Atomic Floyd and the Apple store, the SuperDarts are on sale now for £199.